My street was one of the first subject to the new gas pipelines that Entergy is putting in. So they destroyed major portions of the sidewalk, did their business, and then repaved them. Here in New Orleans, our links to the past are one of the things that make us different. Who doesn't love reading the tile embedded in the sidewalk in front of Ms Mae's? Or Casamento's? But with all this progress, a lot of our heritage is getting flushed down the pooper. Case in point: on Claiborne, where it approaches Jeff Parish, some of the new street signs are green. Not blue, like they've always been outside the quarter. Green, like they were ordered from the same place every other suburban jungle orders theirs. Green, like they have in Houston. This just pisses me off. Yeah, charge me another 1/4 of 1% sales tax. But don't screw with what ain't broke, homes. 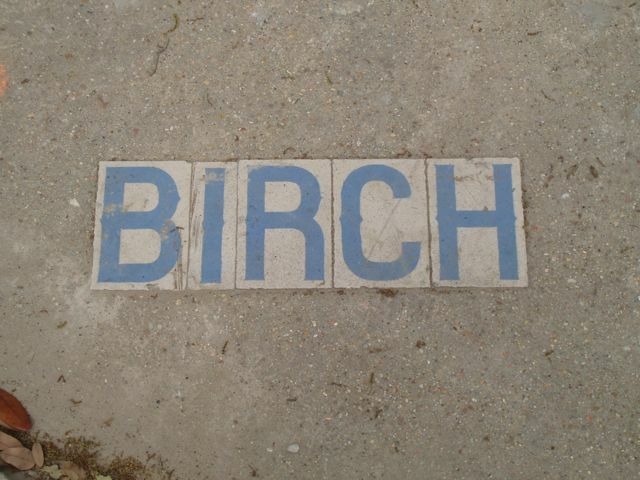 Case in point 2: the old sidewalk on my corner had beautiful tiles inlaid into the concrete, showing the name of the street. These are the little things that let you know that you're on a street with 100+ year old homes, not some Seaside Florida bastardization of all that is Holy in New Orleans. Well, Entergy destroyed these, and just paved it over like we live in Sharpstown. Here's what the old street corner (Birch and Pine, riverside downtown) looks like on the left, and here's what the new street corner (Birch and Pine, lakeside downtown) looks like on the right. You can click on the images for a larger view. Entergy, fix it. Fix it now. You're a damned public monopoly, guaranteed to make a profit. Make it right. It's all important. Update: Here's Entergy's online complaint form. Great post! The before and after pictures say it all. I thought that repairs made were also required to replace what they moved. Damn Entergy NO for all time! I hope you are sending those photos to the media. I know that some people would see that as small beans compared to the big problems. But it isn't. History is very important. Heritage is very important. Seester, I have Karen Gadbois as my attack dog for that. And, the person living on one of said corners is Chris Rose, so I sent him something too. Oy vey. What is so hard about saving the tiles and setting 'em back in the cement? Oh, I forgot. It's ENTERGY. S & WB pulls the same sort of crapola as well. *Gnashing of teeth* Filling out complaint form now. Little good it will do to spend millions on street repairs if the streets department is just going to let utilities tear it all up and leave their wreckage behind. By the way, there's a guy who has spent years mastering the art of re-producing accurate copies of those old street tiles (lower Magazine Street), but the city doesn't want to hire him. He originally started doing it because despite his protests, he couldn't get utilities to stop throwing away tiles when they tore up the sidewalks. My understanding is that tiles are only reset in Historic Preservation Districts. All it takes is an ordinance to fix this. I'm sure Ms. Head will be glad to take it on once she is finished jousting with lifestyle-trailer dwellers. Green street signs? In my old neighborhood? Mooks. Makes me want to come back over there and bring a few cans of blue spray paint. Complaint sent! That is just WRONG! Any progress with getting the street tiles? Re: “We’ll miss the blogger next door,” Living, Apr. 16. Entergy New Orleans Inc. employees care about our city’s historical treasures and our gas business has a long history of providing the safe and reliable natural gas service since 1835. So when we speak about preserving the history of New Orleans, we take that obligation seriously. In his column, Chris Rose mentioned the destruction of street name tiles during our gas rebuild. We would have appreciated the opportunity to provide Mr. Rose the facts about this issue. For the gas rebuild, Entergy New Orleans is working with specially-trained contractors to install new, flood and corrosion-resistant gas pipes. As part of our normal inspection process, Entergy New Orleans managers discovered that a subcontractor’s crew had destroyed the street name tiles on six blocks. That crew was immediately terminated from the job. 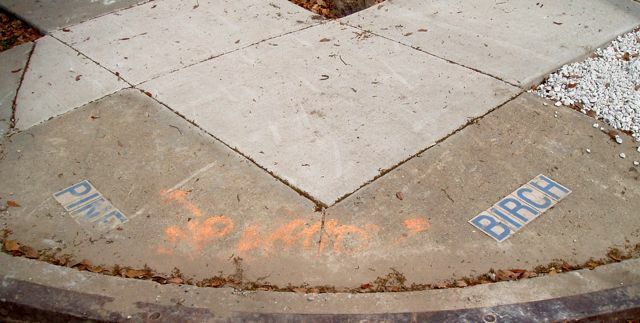 The fact is, of the nearly 1,500 street corners impacted by the rebuild to date, approximately 500 have street name tiles and only about 18 were not replaced – a clear violation of Entergy’s practice. Those tiles were in fact in the process of being replaced before the article was written by Mr. Rose. 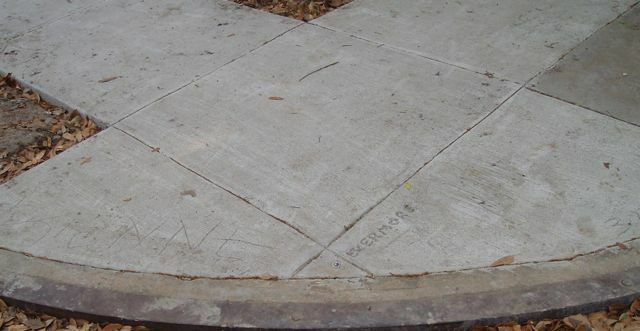 It is Entergy’s practice to carefully remove street name tiles, protect them in a secure location while the work is being performed and restore them to their original street corner. And we always require our subcontractors to follow the same standards, procedures and practices. The discovery and restoration of the tiles was spurred by our employees doing their job well – inspecting the work of subcontractors – and would have been completed regardless of who “reported” the story. We regret any inconvenience and we will continue to work hard to ensure the protection of the city’s historical treasures during this long rebuild process. It is very bad that they were allowed to destroy the differing signs of your city. Nice post! I remember this sign when I walked down the street in New Orleans in my last time I've been there. i always wanted to ask people what does they mean:) Because when I walked in NY, I never have seen the signs. But after reading the post everything is clear! These are the little things that let you know that you're on a street with 100+ year old homes, not some Seaside Florida bastardization of all that is Holy in New Orleans. Having worked for a big box retailer there are many times when perfectly good product is thrown away. Most of the time it is at the direction of the vendor who wishes to sell something else in the same spot. So they offer the retailer money (credit to POs) to throw it away. Failure to do so usually results in a breach of contract between the vendor and retailer. If the bikes were in the trash they belonged there because they were unsellable or paid to be there. OMG, way cool! I would love to have one of these! I'm a huge Scrabble fan (and a damn good expert level pleayr!) and it would just tickle me to death to type on such a cool keyboard every day! Great find! This is just a small example of how companies can waste millions of dollars worth of material and products that are discarded in the dumpster every day in America. And we wonder why the prices are so high? Many years ago my mother-in-law used to work for J.C. Penney’s. One day my wife and I were in the back parking lot waiting for her to get off work so we could give her a ride. My yound daughter was little then and I had to change her diaper. I didn’t want to keep the diaper in the car so I went over to the big dumpster behind the store to throw the diaper away. I am not ashamed to admit that I do go into a dumpster from time to time, ha, ha, and I decided to climb up and take a look in Penney’s dumpster.